Land-use planning • Time is fast approaching for views to mesh into a far-reaching proposal. Leah Hogsten | The Salt Lake Tribune Interested parties listen to the panelists from the Mountain Accord Stakeholder Forum process planning the future of the central Wasatch Mountains meeting to discuss idealized proposals for recreational, environmental, economical and transportational needs of the growing populace, Tuesday, October 14, 2014 at the Salt Lake City Library. 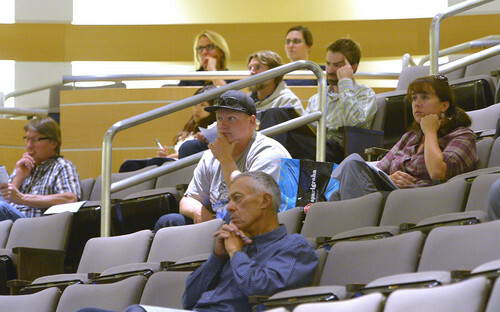 Leah Hogsten | The Salt Lake Tribune Interested parties listen to the panelists from the Mountain Accord Stakeholder Forum process planning the future of the central Wasatch Mountains meeting to discuss idealized proposals for recreational, environmental, economical and transportational needs of the growing populace, Tuesday, October 14, 2014 at the Salt Lake City Library. Leah Hogsten | The Salt Lake Tribune Panelist Jeff Heilman, project manager for the Mountain Accord details the Mountain Accord Stakeholder Forum process planning the future of the central Wasatch Mountains meeting to discuss idealized proposals for recreational, environmental, economical and transportational needs of the growing populace, Tuesday, October 14, 2014 at the Salt Lake City Library. The easy part of the Mountain Accord process came to fruition Tuesday. 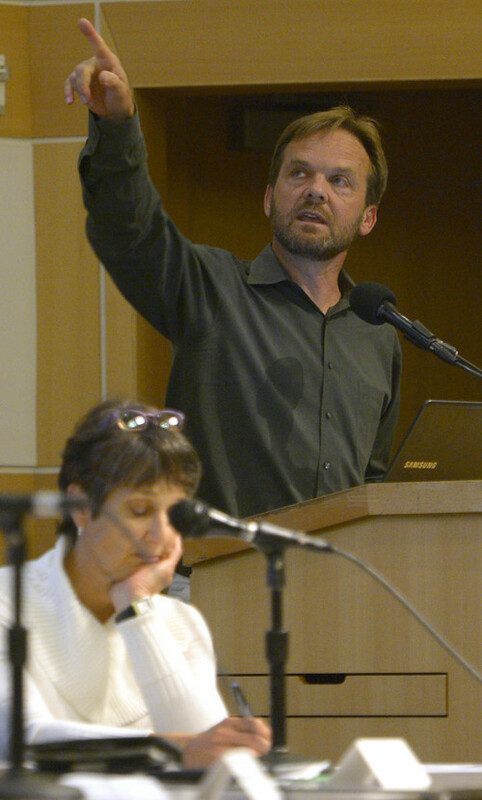 Four idealized views of what the central Wasatch Mountains should look like a quarter century from now  in terms of environment, recreation, transportation and economics  were outlined to a crowd of about 50 people at Salt Lake City Main Library by members of accord committees who have discussed the topics for months. Over the next three months, the executive committee of the Mountain Accord planning process will try to mesh all of those sometimes compatible, sometimes contradictory ideas together and come out next January with an all-encompassing proposal that "balances the objectives of all four" subcommittees, said consultant Jeff Heilman. That supposedly consensus-preferred alternative then would be put through a comprehensive environmental impact study to see if the proposal is doable  and with what conditions or restrictions. But as Salt Lake City Mayor Ralph Becker said in concluding the two-hour session, "we need to coalesce around an approach. We&apos;re not going to move forward in a meaningful way if we have five different transportation proposals." As of Tuesday, actually, there weren&apos;t five, just four. One has buses only serving the Cottonwood canyons. Another has buses in the canyon and a train going to Park City via Parleys Canyon. A third has the train going up Little Cottonwood, under the mountain to Big Cottonwood and then under another side to Park City. A fourth has a train looping the whole circuit. "This four gives a nice bracket of the wide range of alternatives," Heilman summed up. "We don&apos;t expect the [transportation committee] to settle on one in the next two weeks. But they&apos;ll narrow it to a smaller list for the executive committee." Another big issue hovering over the whole Mountain Accord process but yet to be vetted in detail is One Wasatch, the ski industry&apos;s proposal to interconnect the four Cottonwood canyons resorts with the three in Summit County. Conservationists and backcountry skiers hate the idea. "I can understand both sides," said Brad Barber from the recreation subcommittee. "There&apos;s no consensus. The jury&apos;s out." Joan Degiorgio from the environment subcommittee said her group held off on talking about it, "waiting for these idealized systems to jell." Likewise, transportation subcommittee member Robin Hutchison said "we haven&apos;t discussed it much. We know it&apos;s out there. But we don&apos;t think of ski lifts as transportation the way we talk about transportation." 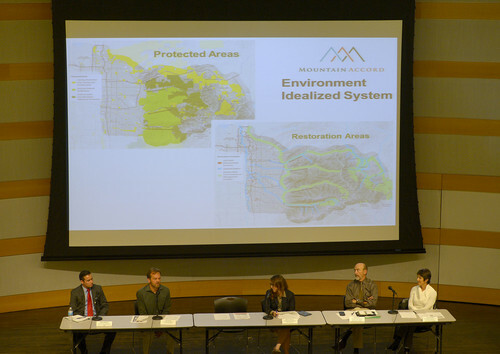 • The environment subcommittee felt "the central Wasatch is a natural ecosystem," Degiorgio said. "The degree to which we can leave it to do it&apos;s thing is going to benefit us all." Watershed protection comes first, followed closely by protection of lands vital to functioning ecosystems. Plans should prepare for climate change. But there wasn&apos;t consensus about whether expanded wilderness areas were the best way to go. • The recreation subcommittee generally felt there should be a concentration of activities in a few high-use areas, such as the ski areas, with provisions made for areas devoted to feelings of solitude and wildness, Barber said. His group also favored development of an integrated trail system that interconnects the Bonneville Shoreline Trail with trails that loop through the canyons and hook up with other trails coming up from the Wasatch Back. • The transportation subcommittee knew its issue was a hot one, Hutchison said, given the strong feelings people have about the pros and cons of trains, gondolas and rapid transit buses. And believing that a selected mode of transportation is "subservient to the other goals," she said her group wants whatever mode is selected to be reliable, safe and that it protect the environment. • Boosting tourism and the widespread benefits it provides was important to the economics subcommittee, but there were differences of opinion within its ranks about whether the One Wasatch concept advanced that goal. Clustering development around Solitude and Brighton in Big Cottonwood, Snowbird and Alta in Little Cottonwood, also had mixed support, with some people advocating for land swaps to buy or trade for private inholdings. On one point there was unanimity, they said. Doing nothing is not an option. "If we don&apos;t do anything," said Mountain Accord facilitator Laycee Jones, "we won&apos;t like what the future holds." Each subcommittee&apos;s ideal maps will be combined in different ways to create a range of balanced scenarios," planning process organizers said. These scenarios will be available for public comment starting Nov. 21, with open houses for the public tentatively scheduled for Dec. 2 and 3.